With the end of 2017 almost in sight, it’s time to examine the pulse of the economy, identify some of the major economic issues today, and discuss the forces affecting the economy’s performance. In this report, I first focus on GDP growth and highlight the effects of the fall-season hurricanes. This analysis shows how America’s massive market economy hardly stumbles when hit by two large natural disasters. I then offer a brief summary of what to expect in the 2018 economy. I next examine the decline of international trade in contrast to the rise of nationalism worldwide. That leads to a discussion of what I term the “Trump redirection.” I then examine how federal regulation is transmitted to the 50 states and affects each one of them. I illustrate that general discussion with an in-depth assessment of North Carolina’s economy and its regulatory environment provided by Patrick McLaughlin and Jonathan Nelson. The newsletter concludes with three book reviews. When the second estimate for 3Q2017 GDP arrived with a much better-than-expected 3.3 percent growth, after registering 3.1 percent for 2Q2017, it sent a pretty strong signal. First off, we can be assured that the economy weathered on in spite of two major hurricanes, threats of nuclear war, and the horrors of the Las Vegas mass killing. The fact that, after these and other shocks, the economy is still sleepwalking on a four-quarter moving average, and not in brief recession, is testimony to the size of the economy and its resilience. The size makes it possible for unaffected regions and components to compensate for hard-hit sections. Its resilience reflects the nature of a market economy where changes in demand and supply are transmitted quickly and effectively across millions of economic agents. Furthermore, the economy’s strength and related ability to generate tax revenues permits governments at all levels to be the insurer of last resort when disaster strikes. In late August and early September, the US economy suffered the effects of two devastating hurricanes. At the time, the US economy was generating 2.2 percent real GDP growth and had added on average 172,000 jobs each month in 2017. Hurricane Harvey made landfall on August 25; its fury focused on Houston—America’s fifth largest city—and the Texas coastal zone. Hundreds of thousands were evacuated. Irma, the next hurricane, hit the Florida Keys on September 11 and made its way along Florida’s west coast, but also severely damaged the Georgia coastline. Almost one million cars hit the road in an effort to escape Irma’s harm. The two damaged US regions were sharply disrupted in varying degrees for two weeks. Economists quickly revised their third quarter GDP growth estimates. On September 12, Goldman Sachs cut its estimate by 0.8 percentage points, bringing it down to 2.0 percent. Moody’s lopped off 0.5 percentage points, adjusting its growth estimate to 2.5 percent, and Oxford Economics cut its estimate by 0.4 percentage points, leaving it at 2.6 percent. Even before we had third-quarter GDP growth estimates, employment and production data were arriving that foreshadowed the GDP numbers. Let’s see what that data told us. On October 6, the Bureau of Labor Statistics indicated that the US economy, which had been adding on average 172,000 jobs each month, sustained a net loss of 33,000 jobs in September. This suggests some 205,000 job additions somehow disappeared in association with the two hurricanes. In August, Texas and Florida together had 22.5 million people employed. Even if the total deceleration of job growth happened in those two states, it would amount to only 0.90 percent of their employment level. I estimate that the total effect of the hurricanes merits a correction of the real GDP growth estimate (four-quarter moving average) from 2.2 percent down to 2.0 percent. The effects of hurricanes Katrina and Rita in late August and September 2005 offer a bit of context here. Real GDP growth in 2Q2005 hit 3.40 percent. The growth rate fell to 3.33 percent in 3Q2005—a loss of 0.07 percentage points—during the quarter when the two hurricanes occurred, and to 3.03 in 2005. As is happening now, employment growth stagnated in the aftermath of the 2005 hurricanes. In September 2005, total employment stood at 134,592,000, just a tad more than the August 2005 level of 134,525,000. Prior to the hurricane month, in 2005 employment growth had averaged 256,000. The Federal Reserve’s industrial production index followed a somewhat similar pattern for Harvey and Irma. The index fell 0.7 percent in August, but increased 0.3 percent in September. During the Katrina/Rita episode, industrial production fell 1.8 percent in September 2005 and rose 1.25 percent in October. Production effects of Katrina and Rita were obviously more severe, yet the economy proved to be resilient in both cases. The hurricane devastation will generate a large construction boom in Texas and Florida, with carpenters and roofers flocking to the affected regions. This comes with a lag, of course, depending on the flow of insurance payments to those who lost insured assets. I watched demand deposit data when tracking the effects of Hurricane Hugo, which hit the US Atlantic coast in September 1989 and imposed large losses on South Carolina. When Hugo hit, bank deposits fell significantly—then, within 60 days, there was a bank deposit surge followed by a fast-paced outflow of funds. We should expect to see the same in Texas and Florida as insurance checks make their way into regional banks. But we should also be aware that an unusually large amount of damaged real estate was not insured, having not been built on a known flood plain. Does this mean that the net effect of hurricanes is real GDP growth? Of course not. They may generate a positive cash flow for the affected regions, but only after a considerable fraction of those regions’ assets were destroyed. Turning from hurricanes, let’s consider the prospects for 2018. These can be summarized in a simple statement: if you felt good about 2017, you should look forward to 2018. In other words, don’t expect to see major changes in the nation’s basic economic indicators. I do not expect policy or other changes to meaningfully affect labor productivity or the size of the workforce. This means that I expect real GDP growth to continue to plow along at a slightly improved 2.3 to 2.5 percent average. Nor do I expect to see Fed policy changes in 2018 that would, during the year, encourage banks to move to higher lending levels that would put more dollars chasing the same goods and services. I expect inflation to remain below 2.5 percent for the year. Because we do seem to be hitting the bottom of the labor supply barrel, I expect to see wage growth rise from the current 2.5 percent annual rate to 3.0 percent. And, given additional interest rate increases by the Fed and broader economic forces, I will look for interest rates to rise but not by more than 100 basis points. In effect, I do expect the Fed will increase rates by the end of 2017, but by no more than 25 basis points, and that we will see, at most, two 50–basis point increases in 2018. On the policy front, I expect to see Congress pass some major tax changes, with corporate rate cuts coming along with cuts in personal income tax rates for most income levels. These cuts will stimulate economic activity and their effect will be reinforced by White House–led reductions in regulations that penalize economic growth. On the other hand, White House interference with trade agreements and the imposition of tariffs and other actions that reduce the nation’s exports will act in the opposite direction, slowing down economic growth. Unanticipated shocks may lead me to adjust this forecast, but—in the absence of such events—look for the economy to continue apace. What’s Happened to World Trade? But there is more going on than political rhetoric and voting. There’s the real economy. Nationalism translated into economic policy often means reductions in the movement of people and goods across national borders. World merchandise trade is in a state of decline. According to the World Trade Organization, the ratio of growth in merchandise trade to growth in world GDP has averaged about 1.5 since 1989. The ratio was well above that in the 1990s, averaging close to 2.5 for the decade. The ratio fell to around 1.0 after the Great Recession and registered a low 0.6 in 2016. The World Trade Organization expects to see some recovery in the next two years, but notes that a return to the 1.5 trend will depend critically on trade policy positions taken by major trading countries. Of course, we are talking about numbers here, ratios, and growth rates. But behind the declining numbers lie complex prospects for improving human well-being. Gains from trade, division of labor, and specialization contribute mightily to higher standards of living. But there’s another, more subtle chapter in this happy story of finding prosperity through trade. As Thomas Friedman pointed out in his 1999 book, The Lexus and the Olive Tree: Understanding Globalization, most people long for a shiny new Lexus automobile. Yes, they do want higher incomes, but they still want to hang on to cultural icons that define how and why they live. They want the Lexus, but don’t want to give up the olive tree that grows in the backyard that symbolizes life-defining culture. The book’s excellent discussion of friction that arises with trade-induced cultural conflict suggests that we might expect to see times when nations attempt to slow the pace of globalization—which would be costly in terms of income forgone—and even take steps to discourage specialization and trade. Nationalism’s political demand is fortified by special interest groups who each have something to gain from fencing off borders. Both industrialists and unions gain protection from competition, and accommodating patriotic nationalists get to keep their olive tree. This desire for nationalism accelerates when recessions generate higher unemployment and rapid technical change makes obsolete a growing list of occupations for people who simultaneously are left with mortgages to pay and limited ability to move to happier hunting grounds. Changing world trade patterns can play a significant role in the process. New sources of supply bring more intense competition; some industries expand, and others contract. Those caught in the gears of change may understandably blame their unhappiness on globalization. According to Matt Ridley, author of The Rational Optimist and former editor of The Economist, the process started at least 100,000 years ago. Somewhere in Africa human populations began to produce and live beyond the level determined by their own biological limits, which was what they could do with their own energy and resources. Individuals discovered what they could do best and with rising specialization and trade came rising prosperity. As Ridley puts it, trade enables connections to be made with the collective human brain. In today’s world where two billion people have smartphones, the collective human brain is working in totally unimaginable ways. At almost zero cost, individuals in remote, faraway places can connect and engage in trade. But closing the door to people and goods that cross a national border is much easier done than building trade relationships in the first place. It is much easier to put antitrade rocks in the harbor and to limit the movement of people and goods than to remove the rocks. President Trump cries “America first!” but what do real data tell us about what is happening to the economy? First, we must realize that the US economy is like a driverless car, but with a tempting default steering mechanism that has lots of slippage between intent and outcome. No one person or group is in charge of the economy, though many would like to grab the steering wheel. Of course, there is the Fed’s Open Market Committee, to which many undeservingly ascribe almost mystical powers to nudge the economy in this direction or that. However, much like my cat, which seems to have a mind of its own, the economy does not always respond predictably to Fed actions and at times seems immune to guidance. More like a biological organism, the economy is constantly adapting and evolving, but it is not totally unguided. There are clearly constraints that affect how the economy takes shape. Statutes, regulations, treaties, and agreements are like software that conditions and limits economic growth and change. And these, such as NAFTA, NATO, the United Nations, and the entire Code of Federal Regulations should be reviewed periodically with an eye toward making adjustments that account for new knowledge, new dimensions added to the economy, and the sheer cost of running the software. For example, NAFTA, now under review, was ratified in 1994 well before the rise of the knowledge economy, the invention of the iPhone, and the expanded international shipment of personal data. Much of the commerce that crosses US borders is not covered by NAFTA. But those who think they can reregulate or deregulate the US economy had best be patient. The wheels of the Federal Register turn slowly, but the grist is fine. From time to time, new political leaders emerge promising to steer the economy in a new direction, only to learn that bringing meaningful change is extraordinarily difficult. The software that limits change is complex and difficult to rewrite. When Donald Trump was elected president, he promised that major change was on the way. Indeed, he claimed that he would fix the nation’s problems, find ways to reinvigorate the industrial economy, and implement changes that would reverse past tendencies always to run a deficit. Of course, newly elected politicians quickly learn they “got to dance with them what brung you” or at least pander to their base. But just how committed is Trump to his promises, for example, to build a wall along the Mexican border and “America first” or to sharply reduce EPA’s regulatory reach? DHS is where the wall operators will be employed. When measured by employment, the Trump 2018 budget calls for a grand total of 279,992 people to be employed in all regulatory agencies. These agencies include the Food and Drug Administration, Occupational Safety and Health Administration, Federal Trade Commission, US Environmental Protection Agency, and 73 other agencies and departments. They also include the Department of Homeland Security. Indeed, some 148,152 people, or 53 percent of the total employed in all regulatory agencies, are employed by the Department of Homeland Security, an agency that was formed from others in 2002. The Dudley-Warren study shows that overall 2018 employment in regulatory federal agencies is set to fall 0.5 percent, but that there is significant jockeying across agencies. For example, the ranks of the EPA workforce are set to be cut by 24.6 percent, which brings the agency’s workforce to the 1984 level. Employment at the National Labor Relations Board is to be cut by 17.3 percent, and the Federal Communications Commission’s workforce is slated to fall 12.2 percent. Of course, none of this happens until Congress develops and approves a final budget. When we consider, along with the proposed budget, other actions taken by Mr. Trump in his first year, we can identify three major signals that characterize the administration’s policy positions. First off, it appears that “America first” is more than a slogan. Mr. Trump has regularly criticized major trading partners, saying that they have gotten the best of us, and he has denied the value of major treaties and agreements where he believes the US got the short end of the stick. Nations that have borne the brunt of the trade tirades include China, Germany, and Mexico. Treaties condemned include NATO, NAFTA, and separate trade agreements with South Korea and Canada. These actions coupled with the budget tell us first that this administration is, at the margin, chilling the pace of globalism and focusing instead on nationalism. “America first” is for real. The administration’s denial of the Obama administration’s Paris Agreement, which set optimistic goals for reducing greenhouse gases over the next 20 years, coupled with sharp cuts in the EPA’s overall budget, key cuts in the Department of Energy’s budget, and significant increases in the budget of the Department of Homeland Security tell us, second, that this administration is ending, at least for now, US leadership in the age of environmentalism and focusing instead on border protection. Finally, the administration’s push for a new federalism, calling on state and local governments to be the first front for solving problems, tells us finally that the Trump administration is serious about reducing the scope and level of national government activities, suggesting that Washington’s relative position will be diminished. That said, it remains true that world commercial activity is still global and will remain that way, that human action inspired by an environmental ethic is deeply engrained in markets worldwide and will continue unabated, and that US citizens and special interest groups will continue to look to Washington for guidance and gifts, knowing all along that there is no such thing as a free lunch. At the same time, those attempting to redirect the nonsteerable economy will have an effect, though not as much as they first thought they would. The nation’s four-quarter moving average of 2.2 percent real GDP growth conceals widely varying outcomes across the nation’s 3,069 counties. I reproduce here a county outline map by Emilia Istrate, chief economist with the National Association of Counties, and Tadas Pack, that reveals some of this variability. 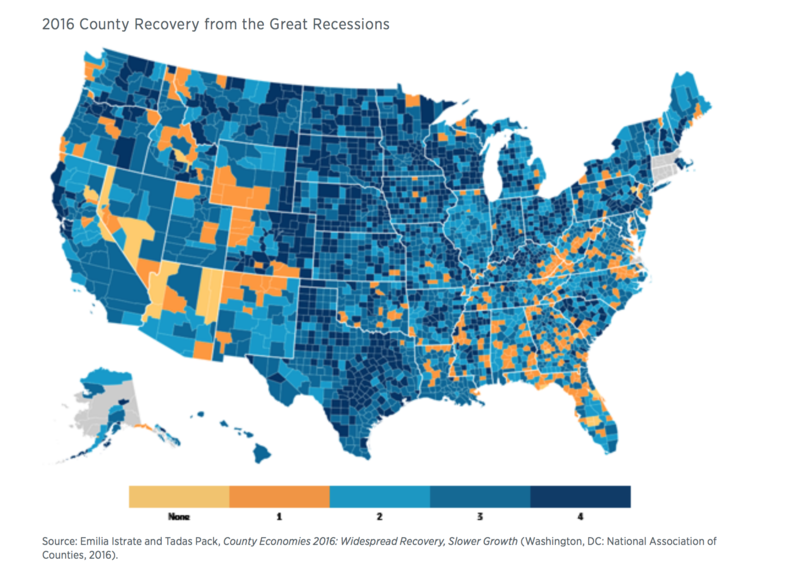 The map reports 2016 county recovery patterns relative to pre-2008 recession levels of performance measured by four variables: total employment, unemployment rate, median value of housing, and level of county GDP. The darkest blue counties have recovered for all four measures. The two progressively paler shades of blue indicate recovery for three or two variables. Light orange counties have recovered for one variable, and the tan counties have not recovered for any of the four variables. By 2016 more than two-thirds of the nation’s counties recovered on at least three of these variables. The data tell us that some 50 percent of the counties have recovered to the prerecession unemployment rate, and a bit more than 50 percent have recovered total employment. Some 80 percent have achieved the prerecession GDP level, and more than 90 percent have seen housing prices recover. The belt of states along the center of the map, starting with North Dakota and reaching to Texas, shows a strong recovery pattern. This reflects reversal of a sharp decline in energy prices that had generally weakened economic activity in those states. There are regions of lagging counties that mark the coal-producing sections of West Virginia and Kentucky. Other weak areas are seen along the borders of Nevada and Arizona and in Wyoming’s coal-producing region; these weaknesses are magnified by the large size of counties in those states. We get another geographic imprint when we consider the world economy in the light of the International Monetary Fund’s 2017 assessment. Notice the green regions in the accompanying map. 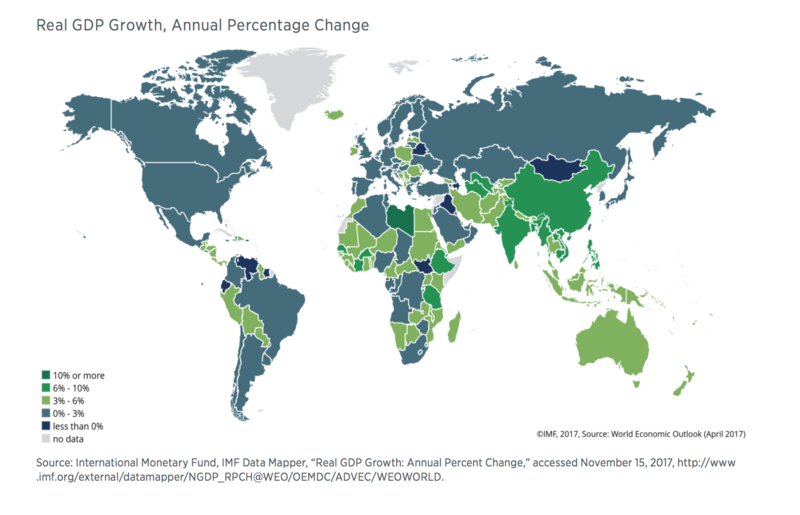 These are where economic growth is predicted to be highest and therefore where it is strategically important to build strong trade relationships so that US goods and services will become embedded in those burgeoning economies. We all know that each of the 50 states engages in regulatory activities that are independent of what may be required by federal law. But we also know that each of the 50 states is home to a distinct industry mix where each firm in each industry must comply with federal rules. The interplay of federal regulation with state economic activity varies significantly across the nation. The resulting regulatory burden is light for some states and heavy for others. 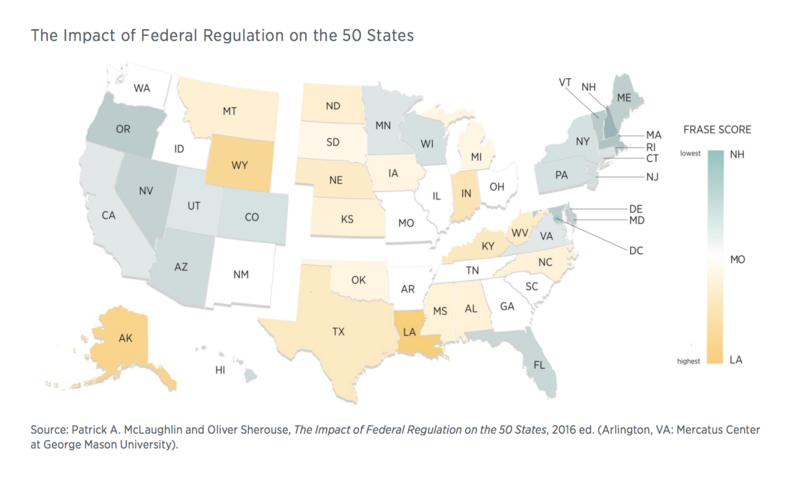 In a 2016 study of regulation across the 50 states, Mercatus scholars Patrick McLaughlin and Oliver Sherouse showed how federal regulatory mandates generate significant differences in regulatory burdens across the states. The two researchers first developed a count of restrictions found in the 2014 Code of Federal Regulations for all industries at the US Department of Commerce four-digit level. They then examined the composition of industries in each state and calculated a weighted index, which they call the Federal Regulation and State Enterprise Index (FRASE). If a state had the same industry composition as the nation, the FRASE was equal to one. Higher FRASE values for a state meant the state’s economy was more heavily restricted than the nation’s. They found that petroleum and coal manufacturing, with more than 25 thousand 2014 regulatory restrictions, was the most heavily regulated industry. Next in line was electric power generation, transmission, and distribution. Motor vehicle manufacturing was number three, and two categories of financial intermediaries were in fourth and fifth place. The resulting FRASE index placed Louisiana in first place for having the heaviest regulatory burden. Alaska was second, Wyoming third, Indiana fourth, and Kentucky fifth. Relative state rankings are shown in the accompanying map. The more tan the color, the heavier the burden. I call attention to Louisiana, Alaska, Wyoming, Indiana, and Kentucky, the darker blue states mentioned earlier. Compare those with Arizona, Florida, Nevada, and Oregon, which, because of their industry composition, are lightly regulated. Of course, regulatory restrictions matter. They deny flexibility when companies seek to innovate in the face of competition; they can also reduce competitive entry, thus clogging the circular flow of income. In any case, the McLaughlin-Sherouse study reveals that a state economy may become heavily regulated even though the particular state itself does not impose a heavy regulatory burden. Let’s now focus on North Carolina and offer an economic assessment. In the last year, North Carolina has enjoyed a period of solid economic growth. Ranking 9th among the 50 states in population with over 10 million people, the state’s personal income grew at 3.8 percent from the second quarter 2016 to the second quarter 2017, better than the nation’s growth rate of 2.9 percent. North Carolina is among the nation’s strongest manufacturing states, ranking 4th nationwide in manufacturing’s share of GDP. In 2016, manufacturing accounted for 19.3 percent of the state’s GDP, as compared with the nation’s 11.8 percent. According to the 2017 edition of the Rich States, Poor States report by economists Art Laffer, Stephen Moore, and Jonathan Williams, North Carolina ranks 9th in economic performance, which takes into account the state’s GDP growth, absolute domestic migration, and nonfarm payroll employment over the last 10 years. The state ranks 3rd in the nation for economic outlook, a forecast based on 15 different state policies and most heavily influenced by tax policy. North Carolina’s high rank in both measures can be largely attributed to the 2013 tax reform act, which reduced the top marginal personal and corporate income tax rates by about 30 percent and 63 percent respectively. An important reason the tax cuts were successful was that the state government also kept spending increases below the rates of population growth and inflation after the cuts. Maintaining the tradition of Orville and Wilbur Wright, who are credited with building and flying the first successful airplane near Kitty Hawk, North Carolina, in 1903, the aerospace industry in North Carolina is still strong. The state is home to dozens of aerospace companies, including Curtiss-Wright, Honda Jet, and LORD Corporation. The aerospace industry more broadly includes about 575 North Carolina companies, which employed nearly 40,000 people as of 2016. Military and government contractors also make up a significant portion of the aerospace industry. In the last 20 years, employment in the manufacturing industry has declined, while professional services, healthcare, and government have largely taken its place, as seen in the chart below. 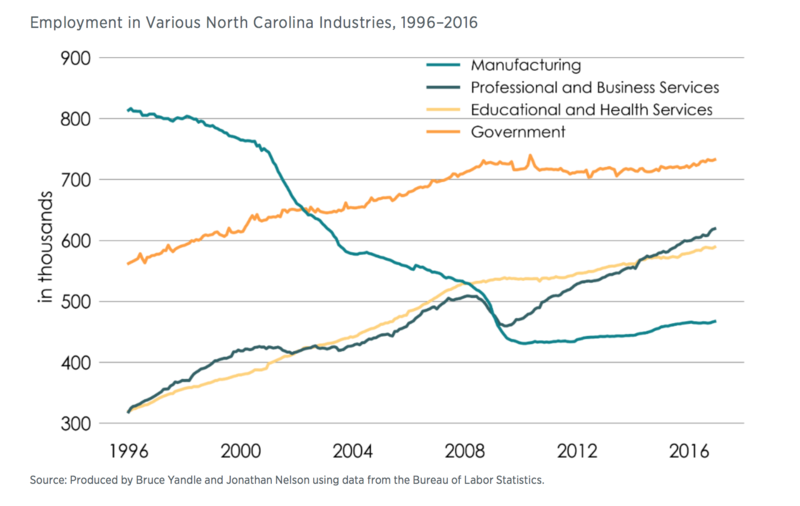 The declining employment in manufacturing may be a sign that the North Carolina economy has undergone a transformation from a traditional economy to a more knowledge-based one. Take the biotechnology industry, for example. North Carolina’s research triangle, which is composed of North Carolina State University, Duke University, and University of North Carolina at Chapel Hill, is one of the nation’s leading hubs of biotech and pharmaceutical companies. The industry includes over 600 companies and employs over 60,000 people. North Carolina is slightly below average in educational attainment, ranking 36th among the 50 states with 86.6 percent of the adult population having graduated from high school, and ranking 27th with 29.4 percent of the adult population having bachelor’s degrees. The state ranks 38th in median household income. The state’s unemployment rate has continued to fall since the 2008 recession, having reached a nearly 17-year low of 4.1 percent in July 2017. The last time the state’s unemployment rate was around 4 percent was in November 2000. In terms of overall fiscal solvency, the state government of North Carolina ranks 15th in the nation in 2017 according to the State Fiscal Rankings project by the Mercatus Center at George Mason University. On a short-run basis, North Carolina has between 1.28 and 2.46 times the cash needed to cover short-term obligations. Revenues exceed expenses by 12 percent, producing a surplus of $493 per capita. On a long-run basis, North Carolina has a net operating ratio of 0.03. Long-term liabilities are 17 percent of total assets, far lower than the national average. Like many other states, North Carolina has issues managing its state pensions, with an unfunded liability of $89.86 billion. What about the future economy? There are two indicators to consider. The first is the current state leading indicator produced by the Philadelphia Federal Reserve Bank. The indicator shows what to expect for the state’s economy in the next six months. As of August 2017, it is very positive for North Carolina. A second assessment of future prospects relates to how far along the transition is to an emerging knowledge economy in the state. The 2014 New Economy Index produced by the Information Technology and Innovation Foundation provides this broader assessment. Their most recent report in 2014 shows North Carolina ranking near the middle of the 50 states for every category (i.e., knowledge jobs, globalization, economic dynamism, the digital economy, and innovation capacity). Overall, North Carolina ranks 23rd in making the transition to the new economy. North Carolina’s regulatory code is published in the North Carolina Administrative Code (NCAC) and contains nearly 8.7 million words. Even as a full-time job, it would take someone nearly fourteen and a half weeks to read the entire code, assuming she read 250 words per minute, 40 hours per week. The Mercatus Center’s RegData analysis found 109,350 restrictions in the NCAC. North Carolina’s state regulatory burden is just below the median number of restrictions (121,741) for the 17 states that have been analyzed so far. Compare North Carolina to New York, the most regulated state, with 307,636 restrictions, and Arizona, the least regulated, with 63,919. In addition, RegData identified the most regulated industries in North Carolina. The top five regulated industries are utilities (4,167 restrictions), nursing and residential care facilities (3,413 restrictions), ambulatory healthcare services (2,366 restrictions), telecommunications (2,201 restrictions), and chemical manufacturing (2,126 restrictions). Many of the restrictions on the utilities industry came from Title 4, Chapter 11, which contains rules from the Utilities Commission. This chapter alone contains 3,229 restrictions. At the federal level, the utilities industry is also heavily regulated. The industry is regulated by 44,633 federal restrictions in addition to the 4,167 state-level restrictions in North Carolina. Utilities are generally a highly regulated industry in many states, including Colorado, (5,488 restrictions), Missouri (6,108 restrictions), Pennsylvania (8,407 restrictions), and Wisconsin (6,518 restrictions). The data suggest North Carolina will continue to be one of the nation’s strongest states and should enjoy strong population and income growth. If you are looking for a wonderful Christmas gift for anyone who would love knowing more about Mark Twain’s life and work, I can think of nothing better than Mark Twain: An Illustrated Biography by Geoffrey C. Ward, Dayton Duncan, and Ken Burns (New York: Alfred A. Knopf, 2001). Yes, it’s been around a while, and yes, it’s the print version of Ken Burns’s produced documentary film. This book came to me this summer as a birthday present from my daughter. A good writer herself, she knows what I like and she knows a good bargain when she sees one. Taking book in hand, a reader will discover Twain’s complicated and creative life. With scores of pictures and excellent writing, the book lends itself to selected reading. Just open it up and start. One section is as good as another. Born Samuel Clemens in 1835 in small town in rural Missouri—a slave state—later to adopt Mark Twain as the name he would use for his writings and for everyday life, Twain became enthralled with his mother, the Mississippi River, printing, and the unaccountable hypocrisy of his day and time. At the time, every town had more than one paper, it seems, and as a printer’s devil who moved from press to press, Twain learned his type cases and how to spell, write, and criticize the written word. Somehow, without the benefit of formal education, by sheer willpower, he became a cultivated man. The book tells of his countless adventures, as a riverboat captain, Nevada silver miner, and California journalist, and explains how Twain eventually became the toast of New York and the world’s most recognized person. By some counts, we learn, Twain was America’s wealthiest man—the 19th century equivalent of the Rolling Stones, Elvis Presley, and Garrison Keillor rolled into one. Beset by personal tragedies and always a sucker for get-rich-quick invention opportunities, Twain lost money almost as fast as he made it, and this kept him on the lecture hustings for his entire life. Upon digesting the book, one may have a different opinion about the author of Adventures of Huckleberry Finn or A Connecticut Yankee in King Author’s Court, but one will surely agree that this book is well worth the bargain price it fetches in the old book marketplace.